For some, the ‘Kiki Challenge’ has not ended well. 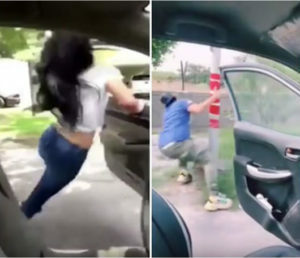 In the “Kiki challenge” – which has gone viral on social media – participants get out of a slowly moving car and leave the door open as they dance alongside it in sync with the song “In My Feelings” by Canadian hip-hop star Drake. “Participation in such unacceptable practices constitutes a crime punishable by law with imprisonment for a period ranging from two months to one year and a fine of 120 Jordanian dinars ($180),” Palestinian police said, according to a report by i24 news. Additionally, the driver’s licenses of participants will be withdrawn and cars may be impounded, the Palestinian police said. The penalty will be doubled if the convicted person commits the same offense within two years. There have been more than 2 million tweets related to the dance, according to Twitter. Other countries in the Middle East have outlawed the “Kiki challenge”. In the UAE, participants face a Dh2,000 fine ($545), 23 black points on their driver’s license and having their cars impounded for 60 days, according to Emirati authorities.